23 руб. 3-4 недели, 20500 шт. 500 шт. 500 шт. 90 руб. 2-3 недели, 966 шт. 1 шт. 10 шт. 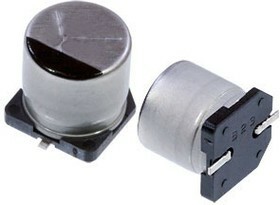 Panasonic FT Series Type V capacitors offer a miniaturised solution and low ESR. They are one size smaller than the Panasonic FK Series. 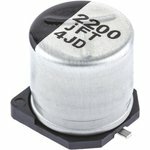 These electrolytic capacitors feature excellent endurance of 2000 hours at +105°C. FT Type V surface mount capacitors can withstand high reflow temperatures for extended periods.